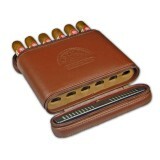 A Cohiba branded leather cigar case containing 3 x Cohiba Piramides Extra cigars (6 1/4" x 54). 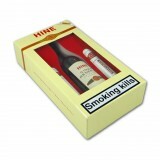 ..
Cohiba Siglo I & II Gift Box A contemporary branded gift box which pivots out ..
An oversized branded tin containing 9 x Cohiba Siglo VI Tubos (5 7/8" x 52) with additional stora.. 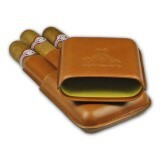 The Davidoff Millennium Blend Assortment is a fabulous presentation of 4 cigars from Davidoff's '.. 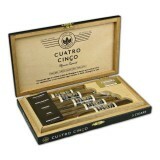 The Davidoff Premium Short Pleasures Assortment is a wonderful presentation of 4 smaller cigars f.. The Davidoff Robusto Collection is a classic presentation of 5 Robusto cigars from some of Davido.. 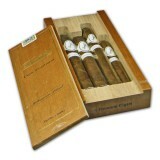 The Davidoff Timeless Classics Assortment is a presentation of Davidoff's 3 most popular cigars, .. The Davidoff Timeless Gift Collection is a presentation of Davidoff's 3 most popular cigars, each..
A stylish brown leather travel humidor containing 6 x aged H.Upmann Robusto. .. This hamper contains 2x Romeo y Julieta No.3 cigars, 2x H.Upmann Junior cigars, an Habanos cigar ..
Havana Hamper - Partagas A wonderful hamper containing 2 x Partagas Serie P No.2 T.. 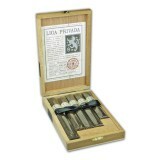 The La Aurora Treasure Box is a superb selection of 5 different Robusto size cigars in individual..